Originally from the swampy rainforests of Asia, the Aglaonema is commonly known as the Chinese Evergreen. A popular ornamental plant for the home or office, it's able to tolerate multiple lighting situations and is somewhat easy to grow. Aglaonema is a burgeoning tropical stunner with a rich abundan. This tropical foliage plant is one of the most durable house plants. It tolerates poor light, dry air, air-conditioning and drought. Grow in moderate daylight (1,600 lux); warm temperatures, 70 to 80 degrees (20� to 25� C); low to moderate humidity. Will grow in water; pot in standard soil; mix with extra humus; let soil dry between watering - needs little moisture. Propagate by division, stem cuttings rooted in warmth, seed, or stem sections. NOTE: If bottom leaves fall so lower stem becomes bare, cut off top and re-root. The bold, heart-shaped leaves of the tropical anthurium plant have inspired its alias "The Flower with a Heart". Also called the flame plant for its passionate symbolism. 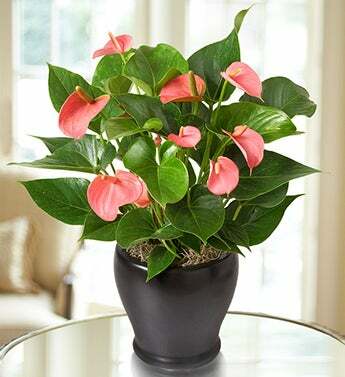 Can be a difficult house plant, the anthurium grows better in a greenhouse because it is so sensitive to cold, temperature fluctuations, hard water and low humidity. Keep away from window sills in the winter, as they are to cold of a location. Grow in moderate daylight; constant warmth (temperatures must never drop below 65 degrees, 18� C); medium to high humidity (either mist foliage daily or place plants over wet gravel). Pot in organic soil or peat moss, keep evenly moist. Propagate from stem cuttings, division, top cuttings, or very fresh seed. Normally a difficult house plant, this tropical, often colorful, foliage plant tolerate poor light but prefers medium light. They will flower once the plant has become pot-bound and winter dormancy is encouraged. Grow in indirect sunlight during the summer and direct sunlight during the winter; constant warmth; high humidity. Avoid drafts and stuffy air. Pot in organic soil or standard potting mix; keep moist, but never wet. Even moisture and medium light will help prevent leaf drop. Propagate from cuttings of side shoots with bottom warmth. NOTE: If many leaves drop in winter, cut back hard in spring. Resembling small Christmas tree, these make hardy house plants, withstanding both dim and bright light and occasional droughts. Grow in indirect sunlight, turning frequently to induce symmetrical growth; relatively cool temperatures, 60 to 70 degrees (15� to 20� C); moderate to high humidity. Protect from drafts. Pot in standard soil mix with extra organic matter. Keep evenly moist. Propagate by seed or air layering. NOTE: In summer they do well if placed outside on the patio or in a protected area. If a tree becomes too tall and spindly due to insufficient light, air layer the top and repot when new roots form. 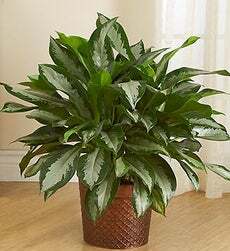 As the name implies, these are hardy house plants enduring heat, dust, poor light and lack of moisture. Grow in low to moderate daylight (they dislike sunlight); moderate temperatures, 65 to 70 degrees (18� to 20�C): low to moderate humidity. Pot in standard potting mix; keep barely moist. Propagate by division. NOTE: Flowers are produced at the base of the Plant. Thousands of varieties of begonias are grown indoors for their pretty flowers, or their foliage alone. Grow in plenty of filtered sunlight; moderate temperature 65 to 70 degrees (18� to 20�C), moist, fresh air. Pot in standard soil mix, let dry between waterings. They are highly susceptible to rot, so should never be kept wet. Fertilize occasionally through spring and summer. Propagate from leaf cuttings, stem cuttings, or division of rhizomes (for rhizomatous varieties). The bromeliads are a large family of plants (Vriesia, Billbergia, Aechmae, Annanas, Bromelia, Guzmania, Cryptanthus, Neoreglia) and one of the hardiest kind of house plants, able to stand much neglect. The leaves grow in rosettes which sometimes form a small water-holding vase at the base. If warm, moist conditions are provided, they develop a spike-shaped colorful flower. Grow in moderate daylight, but they will tolerate shade; moderate temperatures over 65 to 70 degrees (18� to 20�C); moderate to high humidity preferred. Pot in standard soil mix with extra organic matter if desired - the soil must be well-drained; let soil dry between watering - very susceptible to overwatering. For vase-forming species, keep the vase filled with water. Propagate from off-sets rooted in warmth, seeds take a long time to develop. NOTE: To induce flowering, wrap the entire plant in plastic and place an apple inside with it. Remove plastic in four days. Blooms should appear in two to three months. Ethylene gas produced by the apple initiates bud formation. Most bromeliads are epiphytic; they live on trees without being parasitic. Attractive arrangements can be made with bromeliad trees. Choose a large, nicely-shaped piece of driftwood and anchor it into a dish filled with stones. plaster of paris can be used to anchor the branch if it does not balance well. Wrap roots of plants with moist sphagnum moss and wire to wood with covered wire. Place lighter plants near the top. Always keep the moss wet.